Note: This interview pertains to his emails with the US EPA we released this morning, and was conducted before Mayor Walling read the emails between MDEQ and US EPA we obtained and released today. Here is how he responded after becoming aware of MDEQ-US EPA emails we released. He also released a statement available at the end of this article. 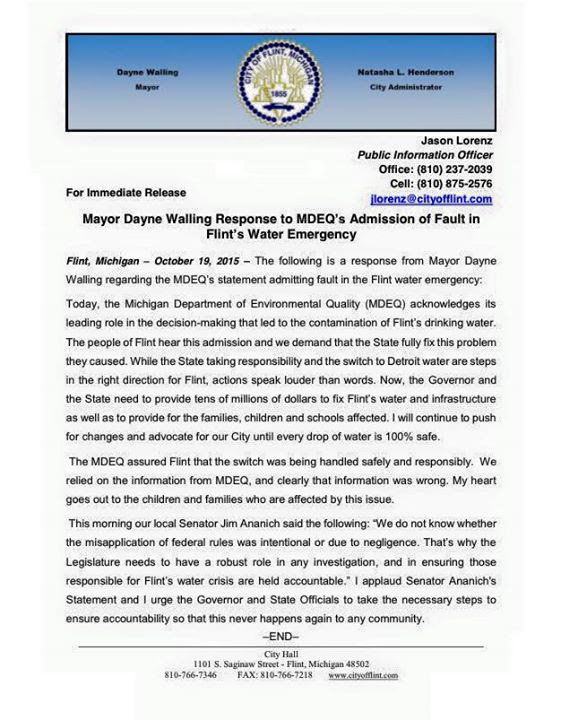 1) When you went on TV to drink the water on July 9th 2015 to show it was safe, was that partly in response to the memo Mr. Miguel Del Toral wrote and the ACLU story raising questions about the safety of Flint water? If so, how much was your decision influenced by Susan Hedman’s e-mail statement to you, and her July 1 “apology” for Del Toral’s memo? Did MDEQ or anyone assure you the water was safe, or was it just that you figured someone would tell you, if any of the authorities had a concern? Obviously, the e-mails provide some context for your appearance on TV. I do a live Thursday inteview on Ch5 every week. They pick the topics and recently there have been many of them about water. I have continued to drink and use the tap water so when they asked me to drink it on the show I did. I don’t know why they chose that week to ask me. I understood Flint water met the standards and that’s why I remarked about it being like standard tap water. 2) At anytime, did Susan Hedman ever tell you who Mr. Del Toral is? Specifically, did she ever say that many consider him to be the foremost expert on the Lead and Copper Rule in the country? Did she ever say he was credible? She stated that the memo was under review. We didn’t discuss the individual other than my expectation that the EPA would provide a response on behalf of the agency if the individual was providing comment to media representatives. Later in the discussions with MDEQ in October, Dr. Hedman strongly defended Mr. Del Toral and all of the agency personnel on one of the planning calls for the joint press event. She specifically challenged the characterization of him as a rogue employee and Dan Wyant apologized. 4) In one newspaper article, you were quoted as saying “Walling said Weaver is making a mistake by citing a letter from “one individual staff person” who does not speak for U.S. EPA.” Did Susan Hedman or anyone from EPA ever once speak up and defend Mr. Del Toral? I didn’t discuss this with Dr. Hedman, that was my understanding at the time speaking as a candidate. Later in the discussions with MDEQ in October, Dr. Hedman strongly defended Mr. Del Toral and all of the agency personnel on one of the planning calls for the joint press event. 5) Did you feel Brad Wurfel’s statement that Mr. Del Toral was a “rogue” employee, correctly summarized the tone of your own conversations with Hedman? 6) In Hedman’s email on September 9th, what “EPA recommendations” could she possibly be referring to? Do nothing or talk to MDEQ? EPA has said or done nothing of substance since Mr. Del Toral’s memo came out, except to apparently revise and vet the memo ad infinitum. We are at a loss as to what she is talking about. 7) Did Hedman ever give a reason for not attending the October 2nd press conference, or meeting with the Pastor’s? Did you feel left high and dry by her? We talked that morning beforehand. She told me that EPA Legal Counsel denied the request to be at the event because a petition for emergency response had been received Thursday night. I was disappointed because I wanted the community to see a united front to fix the problem even though I understood the skepticism especially of the state by the local community. It wasn’t easy for me to stand with only state officials but I felt the City needed to be represented and have a voice so I did. 8) Anything else I should be aware of, or that you want to say about EPA’s role in this? I have found the information from Dr. Hedman and the EPA staff helpful. The challenge for a local official is to know how to access all of the resources available. This is why I made the request to White House Intergovernmental Affairs for a direct point of contact and that is when Dr. Hedman and I connected earlier in the year. Michael Wright was very helpful as we dealt with the tthm problems and the public information around that issue. Dayne Walling is Mayor, City of Flint. ← New Freedom of Information Act (FOIA) request documents answer our earlier question: Where is the US EPA?